From camping to hiking, backpacking, climbing, canoeing, scuba diving, and all the rest - we do it all! We go sailing, scuba diving, and even ride zip lines. We ride trail bikes, kayaks, swim, and so much more! Troop 165 is led by a Scoutmaster and many Assistant Scoutmasters, who value good, solid training and wholesome fun! In our troop, we have many, many Eagle Scouts, and a lot of them have reached the Eagle rank, long before graduating High School! With many Assistant Scoutmasters and Staff, involved parents, and committee members, we make sure that the boys have adult influence and guidance, and all of the instruction they want, and yet still give them the freedom to remain a "Boy-led Troop". "To Facilitate a scout run program through patrol bonding activities patrols will improve communicational skills resulting in a better-organized troop." Why You Should Join Scouting? In a day and time when moral values and the simple elements of character are in a constant state of challenge, there is one group that remains true and steadfast to these: The Boy Scouts of America. It's not easy being a young man in today's elements of society. There are challenges and temptations, pressures and expectations, and choices, some of which can set the path of a young man in the wrong direction of life. The Boy Scout gives his solemn oath to do his best to be loyal, helpful, friendly, courteous, kind, obedient, cheerful, thrifty, brave, clean, reverent and trustworthy. He becomes a part of a team of boys we call a patrol, and will learn to work and support the leader, and later to work towards being a leader himself. 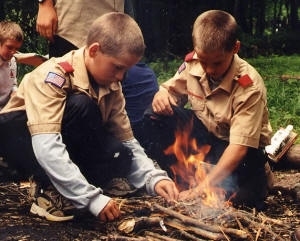 The Boy Scouts is a "boy led" organization, in that the boys are encouraged to be actively involved in the various functions of a troop, which includes the planning and organization of trips and the needed equipment and gear to facilitate these. He will develop friendships, and learn social skills that team him respect, both for himself and for others. He will learn to honor the beliefs and values of another, without allowing the compromise of his own belief systems or the core values that he holds dear. He will learn to be self reliant and resourceful, and will develop the skills that prepare him in handling himself in the various environments of the outdoors, and in life. He will learn about different wildlife that are native to the areas he travels, and how and when to safely interact with each. As he continues, he will be well-versed in how to survive in the outdoors, acquiring skills in building a shelter, looking for food, building a fire, and locating food. He will gain extensive experience in hiking, backpacking and camping, and will develop the skills necessary to perform effective search and rescue. In the Boy Scouts, your child joins us as a young boy. He learns to work with other boys, and develop relationships. He learns to lead, to plan, coordinate and implement. And when it's all said and done, He will be a man. Congratulations to Simon Kruger our 98th Eagle Scout! New parents, please download our Parent Guide here. (Note this is dated and in the process of being revised). Sign up for your Cyber Chip troop presentation HERE.